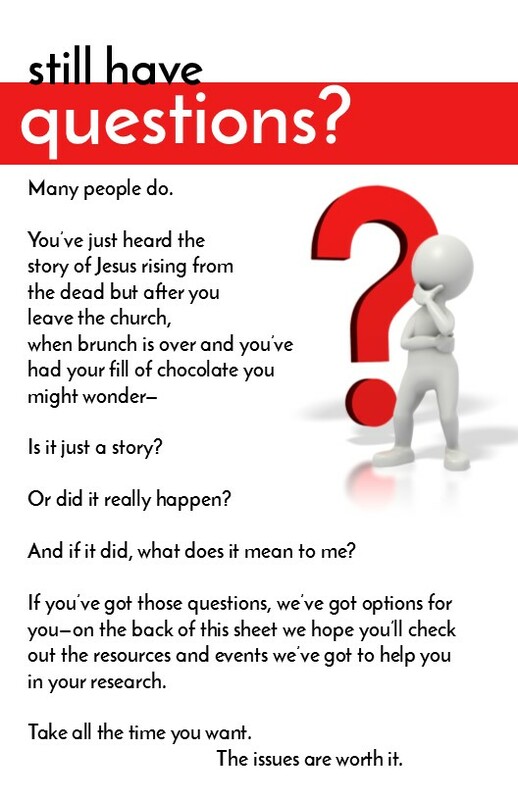 CLICK on the image to download the FREE ZIP file that give you a PDF and an editable MS Publisher file of this handout to help people explore the Christian faith after Easter. When people come to your church at Easter for some of them it may be the first time they hear that Jesus died on the cross so they could be forgiven of their sins and be at peace with God. This is not an easy message to understand if you have not grown up in the church. 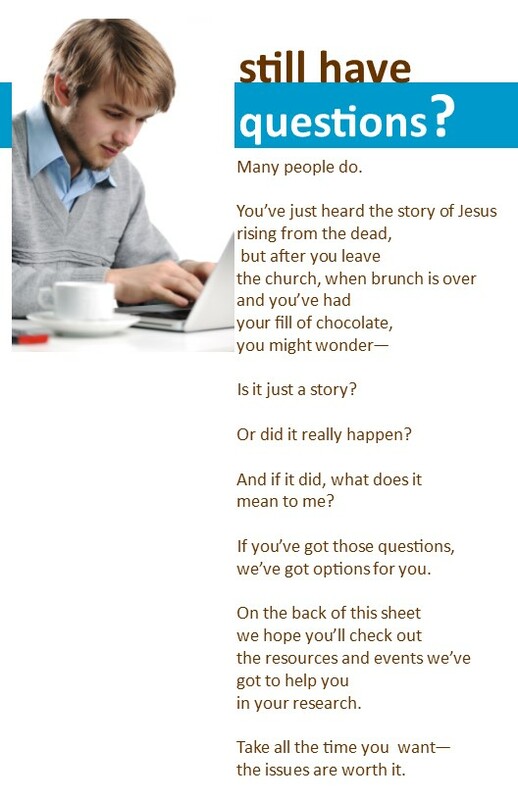 That's why using these bulletin inserts that encourage them to continue an exploration of the Christian faith is so important. The Apostle Paul preached to an audience with much in common with many of the people who will come to your church this Easter. They were part of a world that held many religious beliefs; they may have even heard of Jesus. But again and again you find the same pattern in the book of Acts—Paul would preach a sermon, but then he followed it with extensive discussions as Acts 18: 4 tells us: "every Sabbath he reasoned in the synagogue, trying to persuade Jews and Greeks." He didn't just preach and leave, he reasoned, he taught, he got into arguments and debates. So he reasoned in the synagogue with both Jews and God-fearing Greeks, as well as in the marketplace day by day with those who happened to be there. 18 A group of Epicurean and Stoic philosophers began to debate with him. Some of them asked, “What is this babbler trying to say?” Others remarked, “He seems to be advocating foreign gods.” They said this because Paul was preaching the good news about Jesus and the resurrection. As the passage says, he took time; once again, he reasoned with and debated the people he was preaching to. We don't know how long he did this, but we know he realized one sermon alone would not convince them of the truth of the resurrection of Jesus. It won't for a first-time visitor to your Easter service either. Don't take a lack of immediate response at Easter as an insult, but as an opening to a discussion about and further exploration of Jesus and the Christian faith. These bulletin inserts can help you do that. 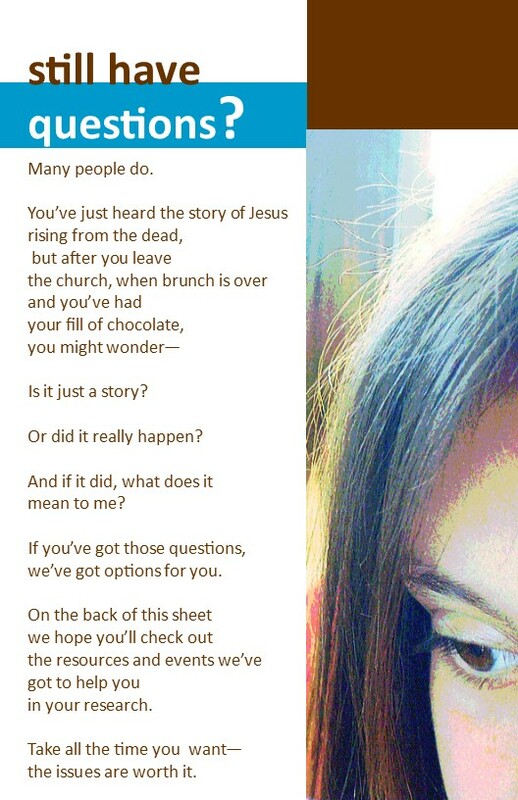 Below are a choice of designs and following that some ideas for what to put on the back to encourage people to continue in their exploration of Jesus. Below them is a ZIP file of ready-to-print PDFs and editable MS Publisher Files. 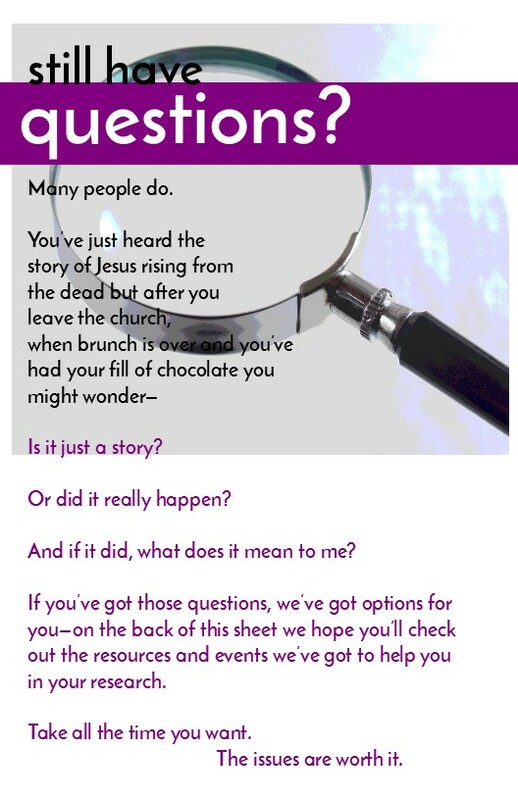 The short messages below were written for Easter but as people have taken and used them in a variety of settings I thought it might be helpful to make them available in text format. If you use them in a different way and have time to send me your creation to yvon@effectivechurchcom.com, I'd love it, but it isn't needed. You've got lots to do this Easter season and I understand. To use these no attribution or link or anything is necessary—other than your prayers that however you use these words that they will bring people to Jesus. The Bunny and the Cross—why both at Easter? It makes much more sense than you might imagine. In many cultures bunnies symbolize life, rebirth, and the tradition of a spring bunny bringing gifts to children. The cross, though once a tool for a tortured death, because of Jesus, has become the symbol of eternal life, possible because Jesus rose from the dead. The Easter bunny tells a story of abundant life, giving, joyful living, pictures of the reality that Jesus made possible on the cross. Join us for our Easter celebration—we’ve got bunnies and candy for the child in all of us, but we’ll also tell the story of the creator of bunnies, and all things joyful and life-giving—Jesus. how dark is your life? Music is inspiring and candy is delicious, but we’d like to invite you to a serious presentation and opportunity for discussion about the true meaning of Easter. No gimmicks, fluff, or marketing an empty message. We believe that Jesus lived, died, and bodily rose from death. We have historical, legal, philosophical, and scientific reasons why we believe this and we would like to share them with you. Not to win an argument, but because we believe the eternal destiny of every person depends on how you respond. What do you think your life would be like if you believed in the Jesus? Boring? Constricted? An endless series of don’t do this or that? Intellectual suicide? We don't think so because. . . . .
Christians claim that Jesus conquered death. If that’s true imagine what it would mean to become a friend and follower of Jesus, someone, totally and eternally ALIVE? Someone who spoke and the worlds, galaxies, stars and starfish, came into being? Someone who, when he walked the earth, played with children, was a great party guest, healed sick people, loved enough to die for all of us. Challenging, exciting, never-ending and never alone—more than you can ever imagine is the life you can discover this Easter, in Jesus.